Another basic method for teaching attitude instrument flying classifies the instruments as they relate to control function, as well as aircraft performance. All maneuvers involve some degree of motion about the lateral (pitch), longitudinal (bank/ roll), and vertical (yaw) axes. Attitude control is stressed in this handbook in terms of pitch control, bank control, power control, and trim control. Instruments are grouped as they relate to control function and aircraft performance as pitch control, bank control, power control, and trim. Pitch control is controlling the rotation of the aircraft about the lateral axis by movement of the elevators. 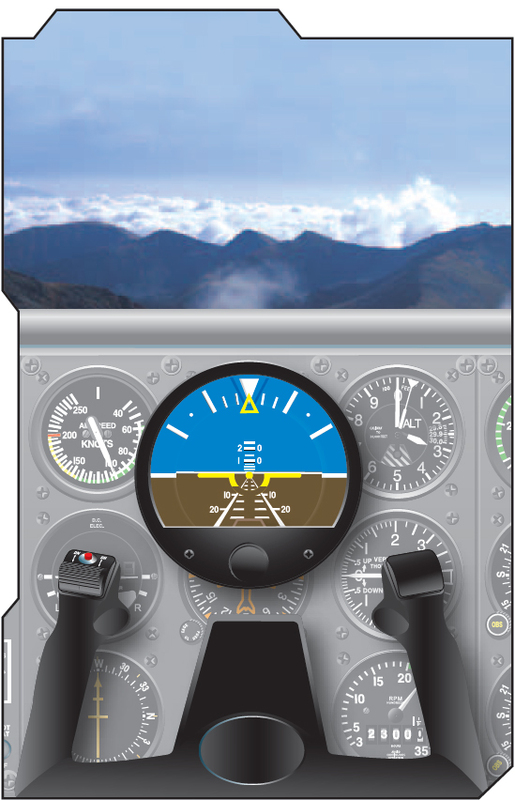 After interpreting the pitch attitude from the proper flight instruments, exert control pressures to effect the desired pitch attitude with reference to the horizon. These instruments include the attitude indicator, altimeter, VSI, and airspeed indicator. 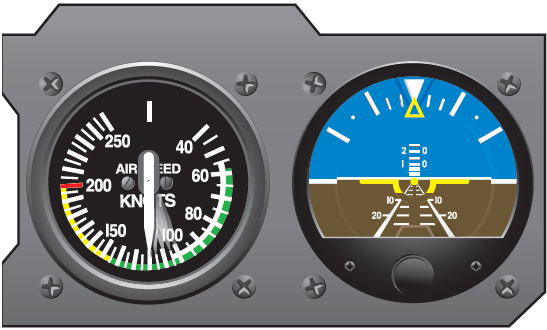 [Figure 6-4] The attitude indicator displays a direct indication of the aircraft’s pitch attitude while the other pitch attitude control instruments indirectly indicate the pitch attitude of the aircraft. The miniature aircraft should be placed in the proper position in relation to the horizon bar or horizon line before takeoff. The aircraft operator’s manual explains this position. As soon as practicable in level flight and at desired cruise airspeed, the miniature aircraft should be moved to a position that aligns its wings in front of the horizon bar or horizon line. This adjustment can be made any time varying loads or other conditions indicate a need. Otherwise, the position of the miniature aircraft should not be changed for flight at other than cruise speed. This is to make sure that the attitude indicator displays a true picture of pitch attitude in all maneuvers. When using the attitude indicator in applying pitch attitude corrections, control pressure should be extremely light. Movement of the horizon bar above or below the miniature aircraft of the attitude indicator in an airplane should not exceed one-half the bar width. [Figure 6-6] If further change is required, an additional correction of not more than one-half horizon bar wide normally counteracts any deviation from normal flight. Figure 6-6. Pitch correction using the attitude indicator. If the aircraft is maintaining level flight, the altimeter needles maintain a constant indication of altitude. If the altimeter indicates a loss of altitude, the pitch attitude must be adjusted upward to stop the descent. If the altimeter indicates a gain in altitude, the pitch attitude must be adjusted downward to stop the climb. 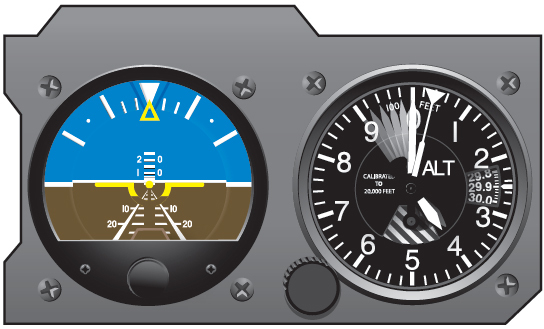 [Figure 6-7] The altimeter can also indicate the pitch attitude in a climb or descent by how rapidly the needles move. A minor adjustment in pitch attitude may be made to control the rate at which altitude is gained or lost. Pitch attitude is used only to correct small altitude changes caused by external forces, such as turbulence or up and down drafts. Figure 6-7. Pitch correction using the altimeter. 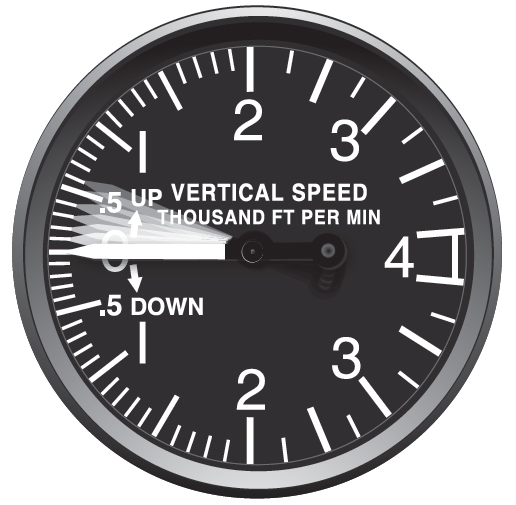 In flight at a constant altitude, the VSI (sometimes referred to as vertical velocity indicator or rate-of-climb indicator) remains at zero. If the needle moves above zero, the pitch attitude must be adjusted downward to stop the climb and return to level flight. Prompt adjustments to the changes in the indications of the VSI can prevent any significant change in altitude. [Figure 6-8] Turbulent air causes the needle to fluctuate near zero. In such conditions, the average of the fluctuations should be considered as the correct reading. Reference to the altimeter helps in turbulent air because it is not as sensitive as the VSI. Figure 6-8. Vertical speed indicator. Vertical speed is represented in feet per minute (fpm). [Figure 6-8] The face of the instrument is graduated with numbers such as 1, 2, 3, etc. These represent thousands of feet up or down in a minute. For instance, if the pointer is aligned with .5 (1⁄2 of a thousand or 500 fpm), the aircraft climbs 500 feet in one minute. The instrument is divided into two regions: one for climbing (up) and one for descending (down). During turbulence, it is not uncommon to see large fluctuations on the VSI. It is important to remember that small corrections should be employed to avoid further exacerbating a potentially divergent situation. Overcorrecting causes the aircraft to overshoot the desired altitude; however, corrections should not be so small that the return to altitude is unnecessarily prolonged. As a guide, the pitch attitude should produce a rate of change on the VSI about twice the size of the altitude deviation. For example, if the aircraft is 100 feet off the desired altitude, a 200 fpm rate of correction would be used. During climbs or descents, the VSI is used to change the altitude at a desired rate. Pitch attitude and power adjustments are made to maintain the desired rate of climb or descent on the VSI. When pressure is applied to the controls and the VSI shows an excess of 200 fpm from that desired, overcontrolling is indicated. For example, if attempting to regain lost altitude at the rate of 500 fpm, a reading of more than 700 fpm would indicate overcontrolling. Initial movement of the needle indicates the trend of vertical movement. The time for the VSI to reach its maximum point of deflection after a correction is called lag. The lag is proportional to speed and magnitude of pitch change. In an airplane, overcontrolling may be reduced by relaxing pressure on the controls, allowing the pitch attitude to neutralize. In some helicopters with servo-assisted controls, no control pressures are apparent. In this case, overcontrolling can be reduced by reference to the attitude indicator. Some aircraft are equipped with an instantaneous vertical speed indicator (IVSI). The letters “IVSI” appear on the face of the indicator. This instrument assists in interpretation by instantaneously indicating the rate of climb or descent at a given moment with little or no lag as displayed in a VSI. Occasionally, the VSI is slightly out of calibration and indicates a gradual climb or descent when the aircraft is in level flight. If readjustments cannot be accomplished, the error in the indicator should be considered when the instrument is used for pitch control. For example, an improperly set VSI may indicate a descent of 100 fpm when the aircraft is in level flight. Any deviation from this reading would indicate a change in pitch attitude. Figure 6-9. Pitch attitude has lowered. 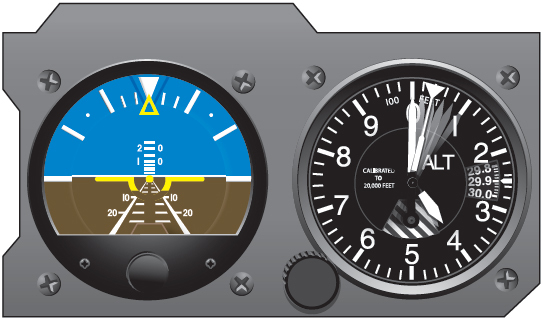 The airspeed indicator gives an indirect reading of the pitch attitude. With a constant power setting and a constant altitude, the aircraft is in level flight and airspeed remains constant. If the airspeed increases, the pitch attitude has lowered and should be raised. [Figure 6-9] If the airspeed decreases, the pitch attitude has moved higher and should be lowered. [Figure 6-10] A rapid change in airspeed indicates a large change in pitch; a slow change in airspeed indicates a small change in pitch. 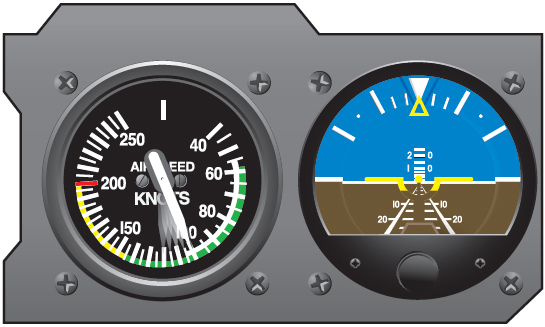 Although the airspeed indicator is used as a pitch instrument, it may be used in level flight for power control. Changes in pitch are reflected immediately by a change in airspeed. There is very little lag in the airspeed indicator. Figure 6-10. Pitch attitude has moved higher. Failing to adequately cross-check the pitch attitude instruments and take corrective action when pitch attitude change is needed.